Hoosier Beer Geek: A Beer Blog for Indiana, from Indianapolis: HBG's July Pint Night, Special Edition | MacNiven's, This Thursday, 7/25, 6:30 p.m.
HBG's July Pint Night, Special Edition | MacNiven's, This Thursday, 7/25, 6:30 p.m.
For our regular readers who may not have heard, our beloved Rodney and his wife Jess (who is a KOTBR emeritus) are moving to Macon, Georgia this weekend. We wanted to give them a proper send-off. So please come out and join us for a special Pint Night at MacNiven's Restaurant & Bar this Thursday, July 25 at 6:30 p.m. as we bid Rod and Jess goodbye. We won't have a specific pint special with tasting notes as we normally do at Pint Night. But imperial (20 oz.) 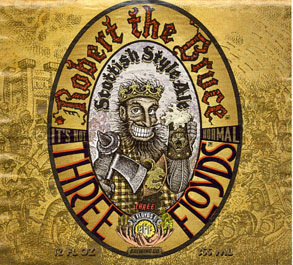 pints of Jess' favorite Three Floyds brew, Robert the Bruce Scottish Style Ale, will be on special for $4.50 a pint. Of course, MacNiven's always has a stellar draft list as well. Robert the Bruce also holds a special place in our hearts because it was the second beer we ever reviewed. We will resume normal HBG Pint Night operations next month, when we will return to the Tomlinson Tap Room, and in September, when we hope to hold Pint Night at the soon-to-be-open Shoefly Public House in Herron-Morton Place.